Towering to over a thousand feet above Midtown Manhattan, ONE57 elevates New York living with the longest south-to-north views of Central Park ever offered in private residences. Walls of glass illuminate dramatic light-flooded homes of extraordinary scale featuring exquisite custom details, the finest-quality finishes, and most dynamic panoramas of Central Park. Pritzker Prize-winning architect Christian de Portzamparc has created a landmark among landmarks that has forever redefined luxury accommodations in New York. Each residence has been meticulously planned with gracious layouts and grand dimensions, setting a glamorous stage for entertaining. Oversized 8' tall solid doors, soaring ceiling heights, rich rosewood flooring, slabs of Italian marble, custom hardware and light fixtures lend elegance at every turn. The enviable lifestyle is enhanced by the exceptional personal services of Park Hyatt's new 5-star flagship hotel. THE RESIDENCE: Residence 77 is a 6,240 SF showplace offering 4 bedrooms, 4.5 baths, and an opulent interior by renowned Danish designer Thomas Juul-Hansen. A private elevator gallery opens into an inviting foyer, beyond which awaits a massive 1,500 SF great room directly facing Central Park for elaborate entertaining. 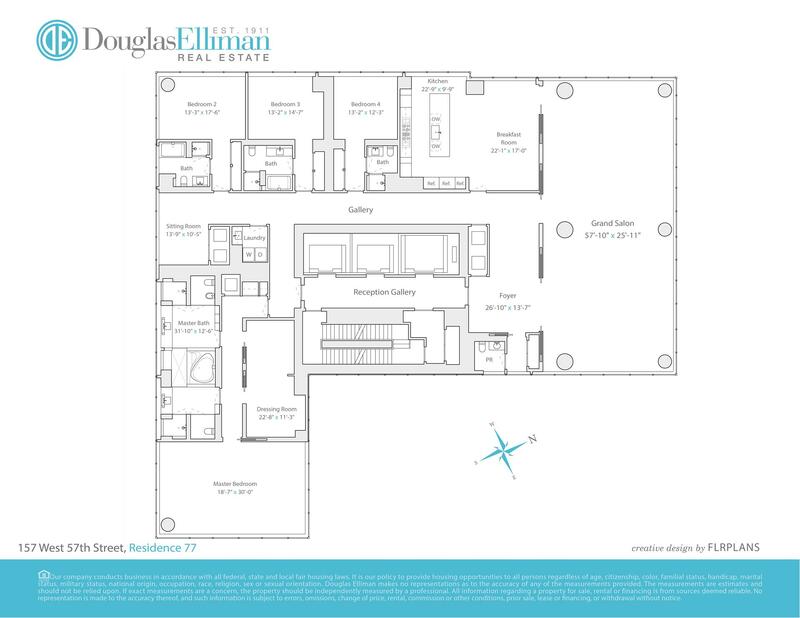 Airy 11' 9" ceilings, Brazilian rosewood flooring in a rich herringbone pattern, floor-to-ceiling sound-proof windows, oversized moldings, trim, and other custom millwork including mother of pearl inlaid closets adorn the exceptional space. The chef's dream kitchen features hand-crafted Smallbone of Devizes cabinetry and premium Miele and Subzero appliances. Master spa bathrooms with dual windows, steam shower and bidet, and en-suite baths with marbled showers and soaking tubs in all secondary bedrooms are divine. A separate laundry room optimizes convenience with a full-size washer/dryer and sink. A complete Crestron home automation system affords one-touch control of audio/visual, motorized shades and lighting throughout. PARK HYATT AMENITIES & SERVICES: A state-of-the-art health club, Spa Nalai, triple-height indoor swimming pool overlooking Carnegie Hall, steam rooms, 24-hour room service, in-residence catering, deluxe spa services, housekeeping service, dry cleaning and laundry service, priority ballroom and meeting rooms access, business center, private residential elevator to swimming pool, bar and restaurant, and multilingual hotel staff are all available to residents of One57. ONE57 AMENITIES: One57 provides an unparalleled level of service with extensive amenities: a 24-hour doorman/concierge, private dining and function room, full catering kitchen, library with billiards room and 24 foot aquarium, arts and crafts atelier room, screening and performance room, private fitness center and yoga studio, discreet additional 58th Street entry, onsite parking garage, and pet wash room. One57 residents also have access to all the services of the Park Hyatt Hotel, with direct access by elevator to the hotel's triple-height indoor swimming pool, spa, steam rooms, custom-designed Jacuzzi and spa portico, and 5th-floor bar and restaurant.